Discussion in 'DIY' started by Jh4db536, Jan 3, 2017. I'm a bit of a tube roller, so I exposed the bias adjustment on the top, and mounted DMM plugs on the back. Add a nice analog meter, and I have a very simple way to tweak bias. It looks done! Is this the secret @jexby amp? To clarify, didn't mount the meter(s) - just pull them out of a drawer. Btw, don't want to distract from @Jh4db536 's awesome build / project, but when I get my head above water I'll post a different build thread. Nope - I'm still tuning. He took a quick listen when we came by to drop off U7, but I'm still tweaking. 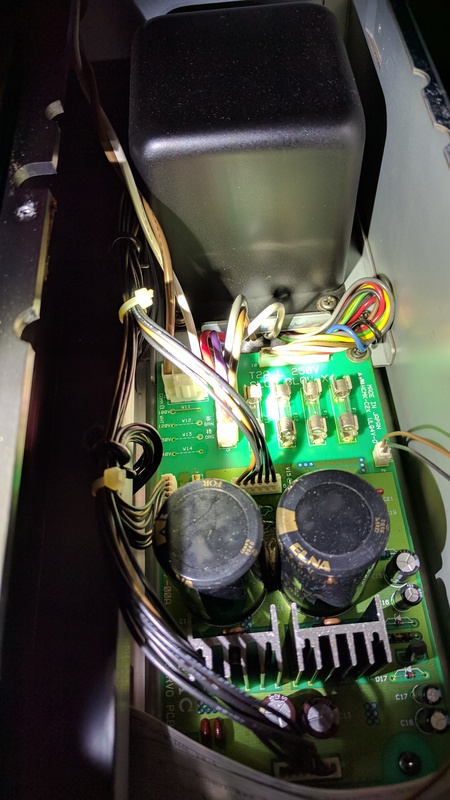 @tomchr would there any sq improvement to be gained from using two independent filregs on the driver tubes rather than sharing a single 6.3v? The output tubes have dedicated filregs. 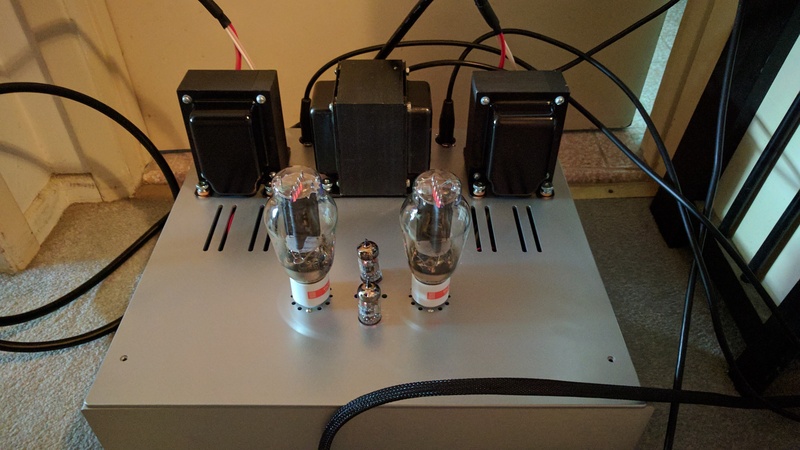 I think it is even made a point on the zds that every tube has it's own transformer + crc?...not as fancy but still independent and clean sounding. I strongly doubt there'd be anything to gain by powering the driver tube filaments separately. They're indirectly heated tubes, so the coupling from the filament to the cathode is small to begin with. On top, the output impedance of the filament regulator is in the single digit mΩ, so that voltage won't budge much, which further suppresses any coupling between the tubes through the filaments. That's not to say that separate filament regulators (or separate transformers) wouldn't make for good marketing copy, though. Modulus-686: 240W/8Ω @ <0.00025% THD. Modulus-86: 40W/8Ω @ 0.000054% THD. HP-1: 3W/20Ω, 450mW/300Ω @ 0.000032% THD. 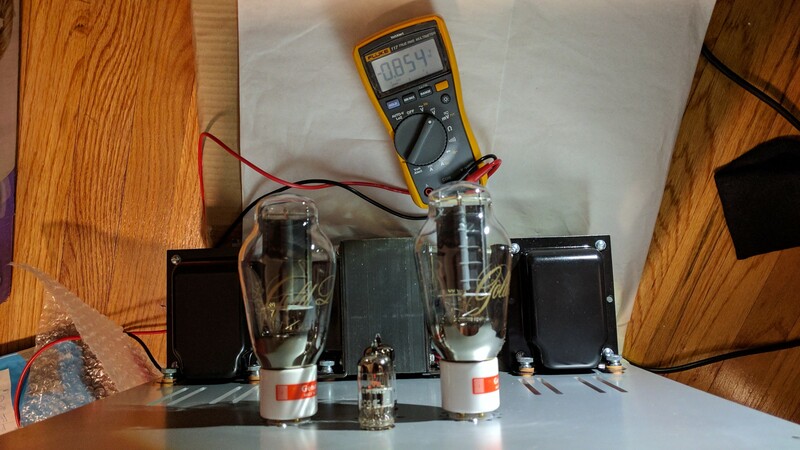 DG300B & Other Tube Circuits. Jh4db536 and bazelio like this. 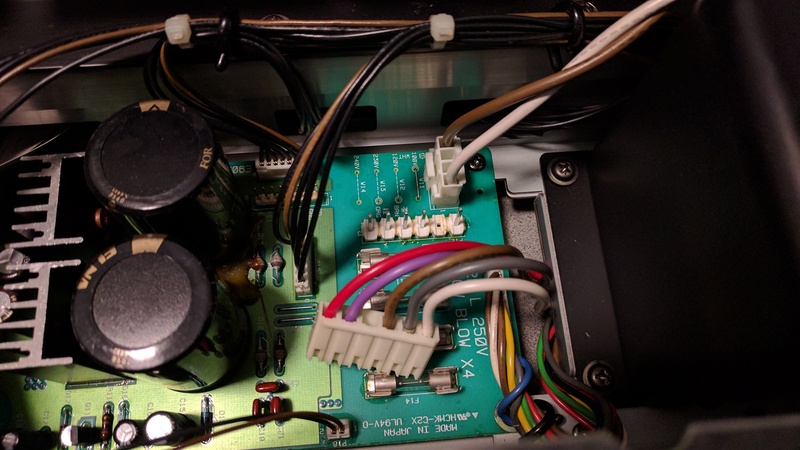 How to convert your JDM CD Player (100V) for USA 120VAC without touching a soldering iron. This is not an international model and doesn't have a voltage switch board. bye bye step down transformer. I think that's hot glue, but if not this thing might need to be recapped. So you cut the jumper and resolder the one for 120V? P.S. That's glue. It's not a bad idea to glue down heavy caps so they don't damage solder connections by wiggling. The standard way would be to cut the jumper and move it to the 120v slots. 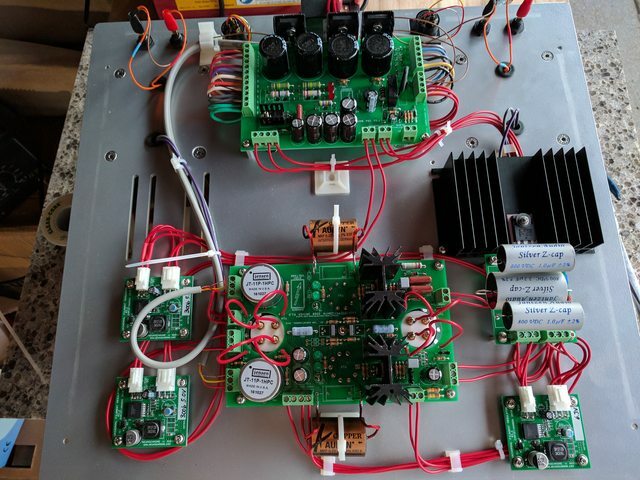 Instead I moved the brown and gray wires in the connector (primaries) and accomplished the same thing without desolder or solder or even removing the PCB from the chassis. Not bad. I'd prolly have moved the jumper, makes future service much easier. That would be my preference as well. Granted The First Rule of Chemistry states, "labels always lie", but there's really no reason to force them to. 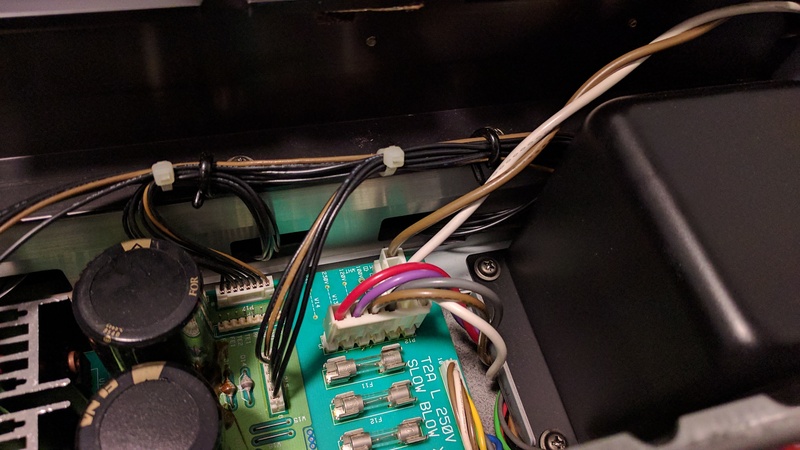 If you go for the re-capping, I suggest moving the jumper and swapping the wires in the connector. Almost done pending Hifigalaxy & DIYA.com for my chassis pieces. This thing is Massive. it could be a lot bigger...the transformers are still a bit close to each other unless i staggered them. cskippy, bxh, Xecuter and 4 others like this. Nice, dude! A true labor of love, and a long time coming. Enjoy it!!! PS. I like the thumb screws (for ease of transformer rolling ). Nicely done. Yeah, the DG300B has a way of morphing into a bodybuilding kit at times. Getting mine off the shelf requires a good grip and proper lifting techniques for sure to avoid a trip to the chiropractor after moving it around. Is the chassis by Landfall by any chance? 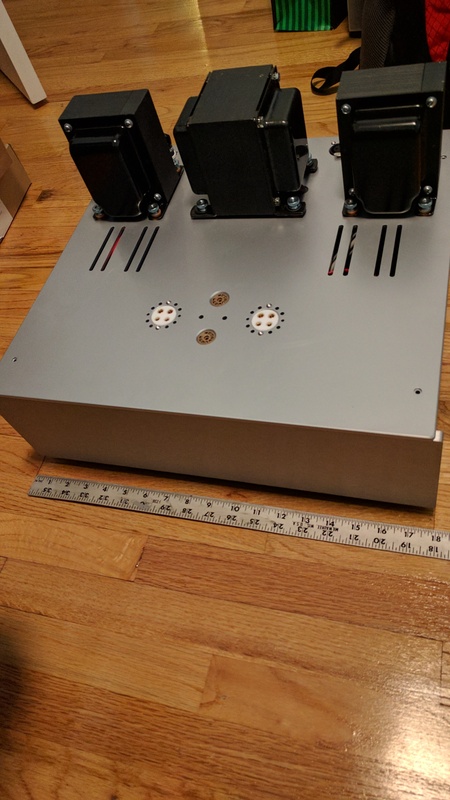 The chassis is a hifi2000 Galaxy / diyaudio pessante 3u. It's really not doing much other than holding up the top because everything is integrated into the plate. 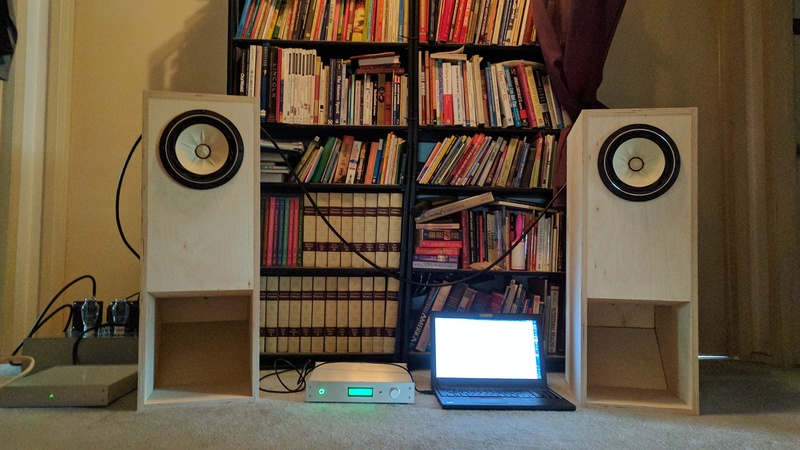 The listening room is far from ideal, but it works. The room is so small i am only about 5 ft from the horns. It's missing the sparkle of the super tweeters. I could probably live without subs. Otherwise Uber mid centric with quite a bit of midbass...i think this will even out a little when i get rid of the USB/change DACs and put in stuffing. Thanks to @Changeling for providing the Siemens PCC88 Driver Tubes. It's going to be interesting when i bring the Yggdrasil and CDT here. 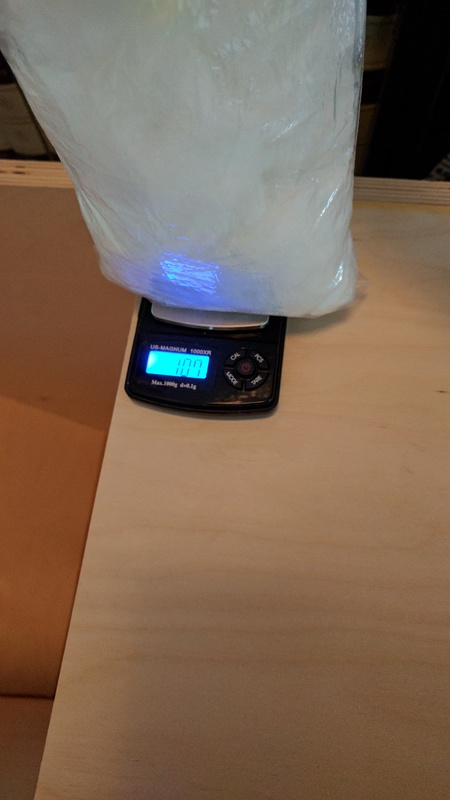 DIYAudio/Hifi 2000 screwed up my order. my enclosure is not done so this is just mockup. I decided im going to put some gauges on it. 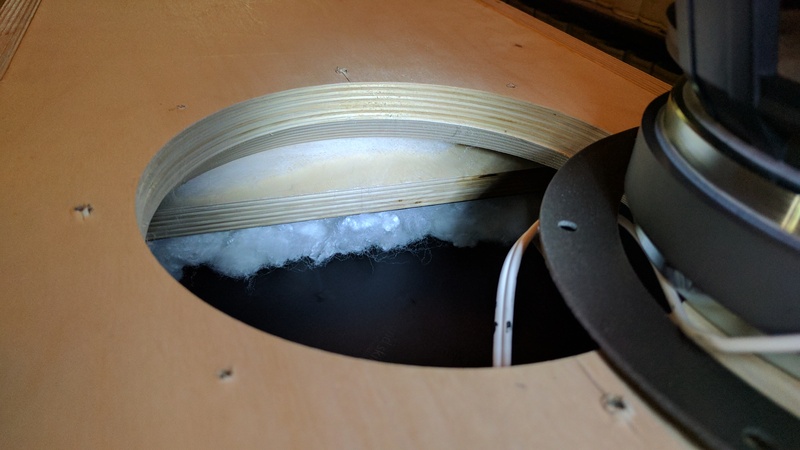 So I wasn't sure how much acoustastuff to use. I know it needed some for sure. As a baseline, I just put in 1/4 oz in the green area and 1oz in the blue area. Changeling, BrettMatthews, FlySweep and 2 others like this. Well... What you need to watch out for is the max die operating temperature of 150 ºC. You need to factor in the thermal resistances from the die to the heat sink to work out the max heat sink temperature. Also, if the heat sink is external, you need to keep the user's fingers safe. That's why I recommend a max heat sink temperature of 60 ºC. 150 ºF = 65 ºC is a little hotter than I'd prefer. It's perfectly safe for the transistor though. In my prototype build, I used a Pentium Pro CPU heat sink for the Maida Regulator and it sat at nearly 100 ºC (don't do this at home kids!). 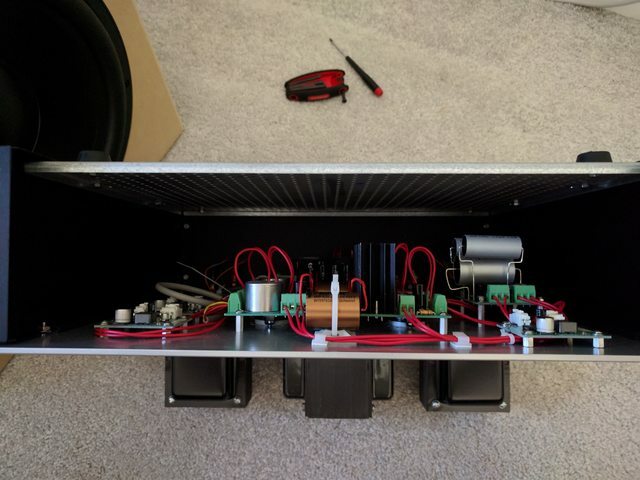 It ran like that for a year until I put the amp into its enclosure. BTW: I have a Summer Sale going on, which includes the DG300B board set (and quite a few other products). Just thought I'd point that out in case anyone is looking to stock up for their winter projects. The sale ends August 31st, 23.59 MDT (GMT-6). I generally don't do sales, so no promises on if or when another sale will happen. bazelio, Priidik, Jh4db536 and 1 other person like this. Mundorf EVO couplers went flat on me all of a sudden. I thought i was going crazy on 'reverse burn in', good thing i have the EC as a sanity check. I dont think ill be using dorfs in future builds. My new favorite caps are Audyn True Coppers, which i started using in my crossover, now couplers. While i was at it, i got rid of those Epcos in my B+ reg. For now, i left in the jantz and audyns. 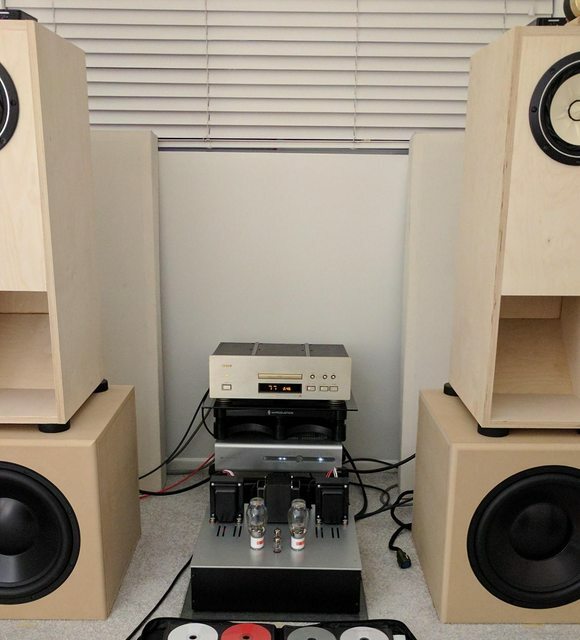 The amp is much more clear and harder hitting than with the dorfs...those things sound flat and boring and i think they get worst over time after about a hundred or so hours. The air is better, staging seems to go out farther in all directions. Clarity, smoothness and refinement is pretty good on this amp, at least as good at the EC or better. This is probably because EH 2a3 tubes in the EC are not as smooth plus the EP transformers probably sound more refined than the Hammond. Details are not lacking on this 300B either and it probably has more resolution and plankton. The way a string is plucked or the way the key in a piano was struck you definitely feel that each one is different not just a note from a electronic keyboard. This amp with the dorf also had high end rolloff which was measurable and actually correlates with Tom's measurements (approx 3db roll - them damn dorfs). I was almost able to run this with no correction (high shelf) compared to the EC prior. After the upgrades, i had to put back in the same amount of correction as the EC to get to be tolerable (EC measures much flatter and less rolloff with EH tubes...i think it is darker and more rolled off with EML tubes). The 300B bloom hasnt changed. It's only slightly bloomy though, but noticeable when you hear it back to back with the 2a3. Again these are with genalex tubes.It's actually not a bad thing because it helps fill out the sound, otherwise BLH would sound thin compared to the EC. The 300B staging is still not as wide as the EC2a3 MKIV and the separation is not as crazy - these are attributes that EC set dht amps blow you away with. Everything happens on the stage, nothing's outside the box like on the EC. It does not throw sound and waves at you. I wish it had that magic. The smaller room that i moved everything into is gimping both setups badly compared to my living room, but the EC can still impress even in this tiny room and practically in nearfield. The 300b in a big room was quite okay. Maybe the high frequency rolloff about -3db is a good thing because I didn't have to use DSP correction to do it. Less correction ultimately sounds better imo. Synergy wise it wasn't so bad before. The clarity and refinement is welcomed. Got a chance to roll the jantz finally... These are way better in every dimension no contest. The audyn are bloomy and warm --- in comparison. So basically I'm in perfect agreement with the assessments made especially given their price. Priidik, batriq, k4rstar and 7 others like this. 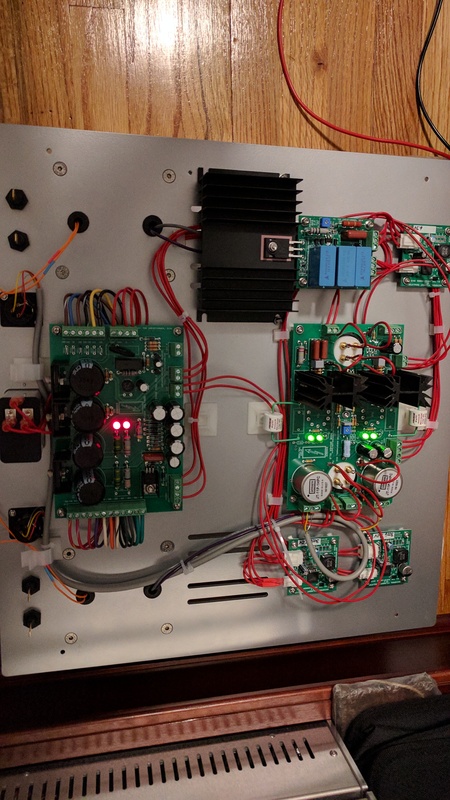 This amp with the dorf also had high end rolloff which was measurable and actually correlates with Tom's measurements (approx 3db roll - them damn dorfs). The high-end rolloff is actually from the output transformer. I measure -3 dB at 36 kHz on my amp (with Electra-Print OPTs). At 20 kHz the amplitude response is down 1 dB from 1 kHz. You can certainly EQ it flat, but I personally don't see a need for that. The 300B is a challenging tube to work with on many levels. It's difficult to drive due to its input capacitance. 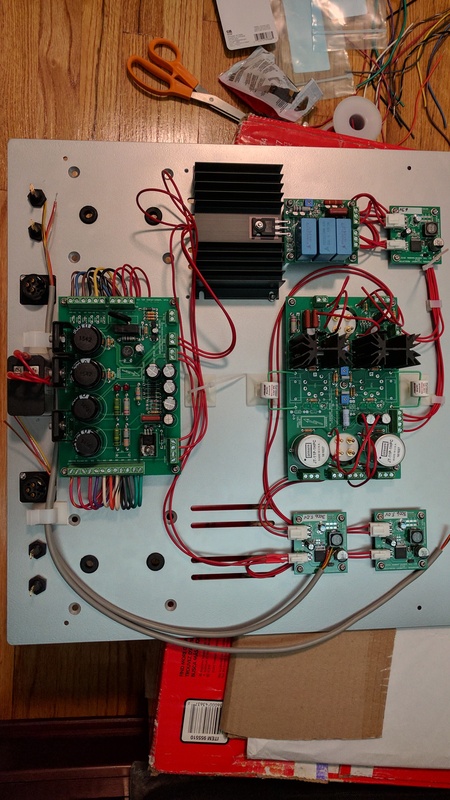 Apparently, it's also challenging to build output transformers for it. 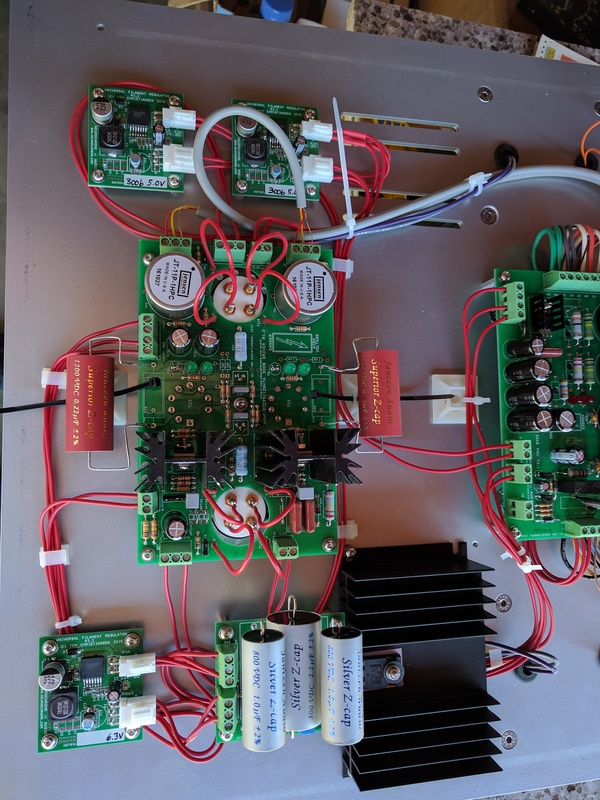 Electra-Print offers a special "300B transformer" with some winding tricks to minimize the inter-winding capacitance and get more bandwidth from the transformers. Whether they work as advertised I don't know as I haven't measured them. [...] plus the EP transformers probably sound more refined than the Hammond. Yeah... Hammond would not be my first choice for output transformers. I have no experience to go by but their product line is just not all that appealing to me. Edcor is my "budget" choice. I hear good things about the James and Silk transformers as well. Personally, I have experience with Edcor and Electra-Print. I found E-P more detailed and cleaner sounding than the Edcor CXSE-series. Whether that's worth the 3-4x cost riser is up to you. There is rolloff from the output transformers and then there was additional rolloff from the caps allegedly since I didn't change anything else. The additional rolloff was synergistic (in my room, less dsp is better) and beneficial because a flatter fr up there would be too hot for my ears. I actually need to induce the additional rolloff with DSP (or toe out my speakers) post modification. The caps don't affect HF rolloff - unless the Mundorf have horrid ESL, which I suppose is possible. How much difference in SPL did you measure at 20 kHz? Was this measured with a microphone or did you hook your analyzer to the output of the amp? The caps (and OPTs) will affect the LF rolloff. The caps are sized for a 2 Hz cutoff. Well below the typical 25-40 Hz cutoff of the OPT.